This is NOT a medical prescription. Keywords: Enhances Energy, Intelligence, Discernment, Healing, Peace, Imagination, Wisdom. Calcite stimulates feelings of inner-peace and is beneficial for manifesting and promoting creativity through imagination. This crystal is a powerful "Stone of Healing." It increases and amplifies energy from within, and removes stagnant energy all around. This gorgeous crystal calms the mind and connects emotions with intellect, enhancing emotional intelligence. Clear Calcite stimulates insight and raises consciousness, accelerating your natural ability to heal. It teaches discernment, analytical abilities, and boosts memory. Calcite is especially beneficial for students. It heightens mental discernment, enhances trust in oneself, and improves retention of knowledge. The enlightening vibration of Calcite brings stability and balance into relationships, enhancing the opportunity for reconciliation. This is a stone of spirituality and wisdom, often used for astral travel and channeling. Clear Calcite helps absorb calcium and dissolves calcification. It opens and clears all Chakras in order to strengthen and purify the skeleton and joints. Calcite helps relieve back pain, regulate the metabolism, and is good for bones, teeth, and skin. Emotional Intelligence, Inner-Peace, Calm, Balance, Clarity, Stability, Clears Emotional Blocks, Revitalizes, Uplifting. Insight, Wisdom, Manifestation, Imagination, Creativity, Retention, Acceptance, Raises Consciousness, Discernment, Decision-Making, Memory Recall. Bones, Teeth, Skin, Brain, Detox, Joints, Skeletal System, Trauma, Back Pain, Metabolism, Calcium Absorption. Keywords: Creativity, Motivation, Courage, Leadership, Endurance, Passion, Prosperity, Stability. This enchanting gemstone greatly enhances passion, love, and desire. Carnelian encourages you to trust your instincts. It stabilizes a "wondering soul" and stimulates emotional harmony. 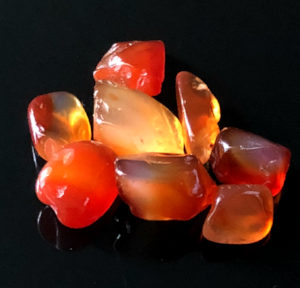 Wear Carnelian to overcome abuse, dispel apathy, encourage steadfastness, calm anger, and enhance creative expression. Carnelian is a "Stone of Creativity." This empowering gem vibrates energy that grounds and stabilizes you in the present moment. It stimulates endurance, leadership abilities, and gives courage. Carnelian promotes discernment, clarifies perception, and improves analytical abilities. Carnelian is said to attract prosperity, new resources and good luck. It is a talisman for success in any money-making venture. In the workplace, it is a crystal of ambition, drive and determination, and wards off undue pressures of co-workers or impersonal corporations with unrealistic expectations. [Eason, 72 ]Cassandra Eason, The New Crystal Bible (London: Carlton Books Ltd., 2010). Carnelian clarifies the voice. It is the Singer's Stone. [Megemont, 46] Florence Megemont, The Metaphysical Book of Gems and Crystals (Rochester, VT: Healing Arts Press, 2008). It also promotes confidence for performances on stage or in live media. [Eason, 72 ]Cassandra Eason, The New Crystal Bible (London: Carlton Books Ltd., 2010). Courage, Confidence, Communication, Purpose, Calms Anger and Resentment, Love, Trust, Self-Esteem, Self-Assurance, Pleasure Enhancing, Enthusiasm, Joy. Concentration, Stimulation, Motivation, Promotes Communication, Awareness, Decision-Making, Victory, Success, Builds Skill. Acne, Aids (HIV), Allergies (pollen), Arthritis, Back Pain, Physical Balance, Blood Poisoning, Colds, Detox, Digestion, Female Reproductive System, Fever, Gallbladder, Heartburn, Impotence, Infection, Infertility, Immune System, Inflammation, Liver, Lower Back Pain, Menstrual Cramps, Oedema (dropsy), Ovaries, Reproductive Organs, Respiratory System, Rheumatism, Scoliosis, Skin irritations, Sores, Spasms, Testes, Tissue Repair, Urinary Track (prevention), Weakness, and Wounds. Keywords: Benevolence, Generosity, Balance, Harmony, Good-Will, Flexibility. Chalcedony absorbs negativity and dissipates it, allowing you to feel the warmth of inner-stability and self-assurance. Chalcedony is a "Stone of Generosity." It protects against negative influences, increases energy and promotes emotional balance. This generous gemstone comes in many different colors including white, blue, gray, green, yellow, red, brown, pink, purple, and black. Each color encourages healing on a different level. Chalcedony wards off feelings of hostility and sadness, boosting confidence and enthusiasm. It balances the mind, body, and emotions. Blue Chalcedony adds creativity to the benefits. It encourages harmony, enthusiasm and good-will. This is a nurturing stone that absorbs negativity and promotes emotional harmony. It stimulates feelings of benevolence and generosity. Blue Chalcedony enhances mental flexibility, and verbal dexterity. It boosts listening and communication skills, enhances self-perception, and improves memory. This is a "must have" gemstone when learning a new language. Chalcedony enhances the immune system. It aids in regeneration of mucus membranes, and banishes edema. It heals the lungs and clears the effects of smoking. This powerful healer assists those who lack maternal instincts, and lessens the effects of dementia and senility. Uplifts, Harmony, Emotional Balance, Understanding, Enthusiasm, Protects Against Negative Energy, Confidence, Self-Respect, Self Esteem, Self Reliance. Learning, Retention, Memory, Clear Communication, Listening, Self-Perception. Immune System, Anti-Inflammatory, Glaucoma, Dementia, Fever, High Blood Pressure, Lungs, Respiratory System. Chakra beads enhance physical energy, cleanse the aura, and bring balance to your entire system. The Chakra System is made of seven energy centers located along the spine and ending in the brain. These chakras have a function which directly effects psychological, physical, energetic and spiritual well-being. Each Chakra has a particular color and vibrational frequency, which coincides with the appropriate healing gemstones. Strength, Endurance, Stability, Letting Go, Release, Renewal. Clarity, Self-Acceptance, Motivation, Drive, Prosperity, Goals, Improves Mental Imbalance. Energy, Cleanse, Aura, Improve, Health, Immune System, Illnesses, Irritation, Sickness, Recovery. Keywords: Luck, Protection, New Beginnings, Vision, Fortune, Confidence, Regeneration. Cat's Eye Chrysoberyl is a powerful and protective gem, known as a "Stone of New Beginnings." This gem is available in many colors, It is known to stimulate the intellect and promote psychic vision. It can enhance intuition and allow you see things that other people miss. Cat's Eye Chrysoberyl is often used for good luck when gambling. Wearing Cat's Eye Chrysoberyl protects you from negative energy and brings good luck, fortune, confidence, optimism and unconditional love. This is a stress relieving gem that promotes dream and memory recall, clairvoyance and out of body experiences. Cat's Eye Chrysoberyl can treat eye disorders and improve night vision, as It aids the body in regeneration and repair. This gem has an affinity with cat's and can be used toward healing them. Intuition, Wisdom, Alertness, Awakening, Insight, Opportunities, Memory Recall. Digestion, Hypertension, Blood Pressure, Lymph Nodes, Pancreas, Spleen, Kidneys, Cancer, Tissue Regeneration, Tissue Repair, Nervous System, Nervous System, Eyes. Keywords: Empowerment, New Beginnings, Encouragement, Motivation, Confidence, Communication. Chrysocolla invites soothing energy that stabilizes emotions, especially during times of transition and change. Wear Chrysocolla to align all Chakra's with the Divine. It brings inner balance, heightens self-awareness, enhances motivation, and builds confidence toward new beginnings. Chrysocolla is a "Stone of New Beginnings." This peacefully sustaining gemstone gently opens the door for communication. It draws off negative energy, alleviates phobia, fear, and anxiety, and encourages one to face their challenges. This awe-inspiring gemstone instills a sense of support and motivation toward accomplishing new endeavors. Chrysocolla reverses self destructive patterns and relieves negative emotions. It stimulates creativity and honest communication. Chrysocolla is a stone of empowerment of the feminine energies, teaching that genuine power is best expressed through gentleness. It is a stone of the Goddess, and those who resonate with it will likely feel her ancient and enduring energies rising within themselves. [Simmons, 114] Robert Simmons & Naisha Ahsian, The Book of Stones (Berkley, CA: North Atlantic Books, 2007). It is the stone of forgiveness, peace, and the strengthening of emotional bonds. It encourages compassion, and helps us recover our natural spontaneity. [Megemont, 54] Florence Megemont, The Metaphysical Book of Gems and Crystals (Rochester, VT: Healing Arts Press, 2008). Supportive, Comforting, Soothes, Calms, Emotional Expression, Communication, Compassion, Acceptance, Inner-Strength, Peace, Recovery from Violence, Anxiety, Stress, Fear, Panic, Depression, Seclusion. Knowledge, Discernment, Wisdom, Business, Strengthens Character, Truth, Insight, Inspiration, Creativity, Expression, Teaching, Learning, Inventions, Ability. Arthritis, Asthma, Bronchitis, Diabetes, Digestive tract, Lungs, Leg Cramps, Menstrual Cramps, Sore Muscles, Pancreas, PMS, Pituitary Gland, Prostate, Regulating Insulin, Reproductive Organs, Skeletal System, Ulcers. Keywords: Joy, Happiness, Inner-Child, Truth, Love, Empowerment, Heart-Space, Forgiveness. Chrysoprase will empower you to understand your divine truth as it centers you within your own heart. Chrysoprase is a "Stone of Abundance and Truth." This peaceful gemstone resembles the color of a green apple. It promotes hope and gifts personal insight. Chrysoprase stimulates the Heart and Sacral Chakras and gives courage toward forgiveness and compassion. This gorgeous gemstone activates the Heart Chakra, it opens heart space, allowing feelings of universal love, joy, and happiness. It heals the inner child by releasing emotional blocks and allowing one to "let go" of the past. Chrysoprase removes oppressive and recurrent images and is extremely helpful in preventing nightmares, especially in children. It assists in overcoming egotism, compulsive or impulsive thoughts and actions, and codependent behavior. This generous green gemstone attracts new love, prosperity, and universal energy, while encouraging fidelity and commitment in relationships. Chrysoprase stimulates the liver and encourages the body to eliminate waste. it balances emotions, soothes the digestive system, treats issues with the lungs and thymus, and alleviates mental and physical exhaustion. Trust, Stability, Emotional Balance, Love, Hope, Forgiving, Moving on, Meditation, Inner-Growth, Healing. Mental Illness, Communication, Adaptability, Discernment, Problem Solving, Decision Making, Truth, Independence, Creativity, Draws out talent. Eye Problems, Bleeding, Blood Pressure, Childbirth, Detox, Fallopian Tubes, Female Reproductive System, Fertility, Gout, Hemorrhage, Hypoglycemia, Lungs, Thymus, Prostate Gland, Shingles. Keywords: Wealth, Abundance, Positivity, Business, Manifestation, Joy, Self-Esteem. Citrine enhances creativity, revitalizes the mind, and generates abundance. Citrine is a "Stone of Positivity." This positively powerful stone vibrates with the uplifting energy of the sun. It warms and energizes the soul, bringing joy and light to the whole environment. Citrine is also known as ,"The Merchant's Stone." This is one of the strongest stones for manifestation. When placed in the cash register of a business, it helps one acquire and maintain wealth. Citrine enhances concentration, especially in children, and encourages feelings of joy. It activates intuition, open-mindedness, self expression, self-worth, and raises self-esteem. Wear Citrine to overcome depression, phobias, over sensitivity, and anger issues. Citrine boosts the immune system. It benefits the nervous and digestive system, stimulates healing in the liver and stomach, aids in tissue regeneration and helps to combat stress and depression. This gemstone has excellent health benefits for people with diabetes. Joy, Happiness, Optimism, Enthusiasm, Self-Esteem, Depression, Self-Expression, Empaths, Over Sensitivity, Anger, Fear, Stress, Pleasure. Concentration, Focus, Manifesting, Self-Worth, Phobias, Awareness, Creativity, Assimilation, Success, Intellect, Learning, Teaching, Prosperity. Diabetes, Digestion, Gallbladder, Kidneys, Thyroid, Tissue Regeneration, Liver, Stomach, Immune System. Keywords: Awakening, Transformation, Self-Improvement, Relationships, Emotional Healer. Coral is an emotional healer that can ease feelings of abandonment, anger and resentment. Red Coral is a "Stone of Transformation." It brings courage, protection and spiritual awakening. This gem encourages you to let go of inner ugliness and negative feelings that are holding you back. It encourages you to find the beauty within your soul. Red Coral strengthens the circulatory system and helps build strong bones. It stimulates regeneration of the tissues, and nourishes blood cells. This gem is beneficial for treating issues with the nervous system, kidneys and bladder. It is known to enhance the mother-daughter relationship and helps parents bond with an adopted child. White Coral is a "Stone of Improvement." This stone is used for debilitating conditions, when anxiety and fear of the unknown hinder progress. It helps build inner-strength, confidence and improves communication. Courage, Inner-Strength, Protection, Peace, Enthusiasm, Confidence, Optimism, Emotional Healing, Awakening, Enlightenment, Unity. Intuition, Creativity, Imagination, Wisdom, Intellect, Knowledge, Learning Skills. Circulation, Menstrual Cramps, Fertility, Acid Reflux, Colic, Urinary Tract, Tissue Regeneration, Whooping Cough. Keywords: Grounding, Fun, Joy, Laughter, Cooperation, Relationships, Child-Like, Protection. This gemstone has a slow, yet strong vibration. It should be used or worn for at least two weeks. Dalmatian Jasper is a "Stone of Child-Like Joy." This stone appeals to the child within and encourages a sense of playfulness. It's grounding energy contributes to family bonding and partnership loyalty. Dalmatian Stone encourages fidelity and emotional harmony, strengthening family bonds and long-term friendships. It encourages team effort and cooperation at work. [Eason, 300 ]Cassandra Eason, The New Crystal Bible (London: Carlton Books Ltd., 2010). Dalmatian Jasper is extremely calming for both children and animals. It removes disillusionments and encourages you to "let go" of thoughts and patterns that are no longer necessary. This playful gemstone promotes a sense of vulnerability. It reveals your strengths and weaknesses, increases loyalty, and reminds you to keep the fun alive. Dalmatian Jasper brings protection from nightmares, negative thoughts, depression, anxiety, and dis-ease. Dalmatian Jasper stimulates the nerves and reflex actions. It benefits the muscles and tendons. It is also known to boost the immune system and remove toxins. Comforts, Grounds, Uplifting, Happiness, Excitement, Joy, Bonding, Emotional Harmony, Alleviates Skepticism and Negative Patterns, Anxiety, Stress, Depression, Worry, Fear, Doubt. Expression, Vision, Encouragement, Group Projects, Team Cooperation, Encourages Learning, Activates Curiosity. Stamina, Blood Purifier, Muscles, Nerves, Immune System, Allergies, Allergic Reactions, Tendons, Detox, Digestion, Bowel Disorders, IBS, Constipation, Skin Rashes.